The already damaged and sole power plant in Gaza was damaged even further, leaving most of the Strip without electricity. 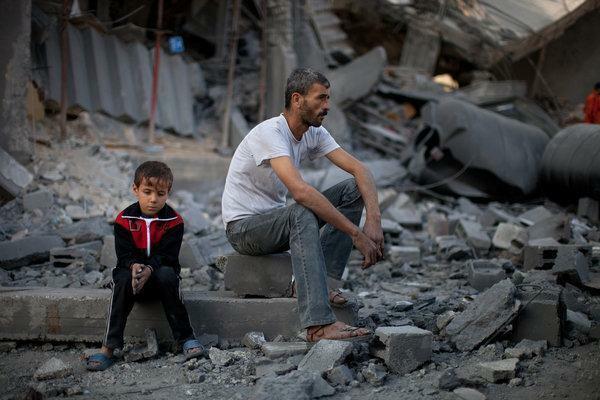 The United Nations Development Program estimates between 16 and 18,000 homes were severely damaged or destroyed and over half a million Gazans (out of a population of roughly 1.8 million) have been internally displaced. This is clearly the worst hit Gaza has taken, demonstrably more severe than Operation Cast Lead of 2008-09. Even so, there seems to be no appetite in Gaza for a return to the status quo ante; whether from the mass media, social media or my own interactions, there is a consistent call for an end to the seven-year long Israeli blockade of Gaza as part of a lasting ceasefire. Concomitantly, Hamas, although still facing the same problems it was before this started (an inability to pay civil employees, increasing isolation in the region due to the decline of the Muslim Brotherhood and little leverage of their own to address Gaza’s economic woes) has been considerably strengthened politically by Israel’s onslaught. Once again, Hamas survived without conceding, and that grants them a considerable boost. It won’t last forever, of course, but they have re-established themselves as the leaders in confronting Israel. The unity agreement between Hamas and Fatah has apparently survived the fighting, although in practice the destruction of Gaza’s infrastructure makes implementation there much more difficult. Palestinian unity was the primary reason that Israeli Prime Minister Benjamin Netanyahu lied to the Israeli public about the fates of the three murdered Israelis in June, the event which started the spiral into this violence. That, too can be counted as a victory. The relationship between the Palestinian Authority and Hamas is very unclear. It seemed strained in June, as Israel swept through the West Bank under the pretext of looking for the three youths who they knew were already dead. Palestinian President Mahmoud Abbas continued his security cooperation with Israel during this time, and even once the fighting started in Gaza, Abbas prevented demonstrations to protest the Israeli action. But as the fighting wore on, Abbas, who at first supported Egypt’s ceasefire proposal that Hamas could not accept, began supporting Hamas’ demands to end the fighting. By the end, Abbas was accusing Israel of war crimes, threatening to sign the Rome Statute and thereby bring Israel to the International Criminal Court, and calling for the end of the blockade of Gaza. Officially, the PA has not moved off of the unity agreement. That is a major victory for Hamas. Still, Hamas could not have missed the signals of this round. They managed to raise global awareness of the blockade. But for Hamas, they found themselves being pressured by the Arab League as a whole. Turkey and Qatar remain Hamas’ only allies, but they proved largely ineffectual against the United States, Egypt, and the Saudis (despite the Saudi rhetoric, which was varied and clearly unsympathetic to Hamas, while being sympathetic to Gaza’s civilians) on Israel’s side. At this point, it seems that the effort is to get the PA back into the business of controlling Gaza’s borders. For Hamas, that will be a mixed blessing. If it happens with the unity agreement intact, then Hamas will have won themselves a clear place in the Palestinian political system, and Israel will have to accept it if they let the PA administer the border crossings. Israel won’t like that at all, but the US, Egypt and the Saudis may push hard for such an arrangement, in the interest of stability. And it will certainly be a step toward ending Hamas’ control over the Strip, to the extent that there is anything that can legitimately be called Palestinian control in Gaza. Israelis are not buying into Prime Minister Netanyahu’s claim of decisive victory in this operation, but they are overwhelmingly supportive of Netanyahu’s decisions. In part, this reflects an appreciation of reality—Israel did a lot of damage in Gaza, but didn’t do itself a lot of good. The other part is that most Israelis saw that Netanyahu didn’t really want things to get this far. Bibi whipped his country into a racist frenzy when those young men were kidnapped. Knowing Israeli sensibilities as he does, Bibi knew that their deaths would end the story, but a kidnapping would continue to boil feelings among the hardline sectors of the Jewish populace. The idea was to drum up popular support for a series of actions against Hamas which, Netanyahu hoped, would shatter the Palestinian unity deal. But Bibi’s right flank immediately started pressuring for escalation. Bibi didn’t want that, but once Hamas started fighting back in earnest, the political pressure for a broader operation was more than he could resist. The pressure continued, as did Hamas’ firepower, probably more than Bibi expected them to use. As matters escalated, Netanyahu had to keep re-defining the mission’s goals. First it was punishing Hamas for the murders, then it was a “quiet for quiet” arrangement, in other words a straight up ceasefire. The tunnels are very frightening to Israelis and it does seem that Israel has eliminated them. But there are two big problems with this narrative. One, destroying the tunnels was the main focus of the ground operation. Yet Egypt managed to destroy hundreds of tunnels without such operations. They simply flooded them from the Egyptian side. The second problem is that, as understandable as it is that the tunnels terrified Israelis, it’s worth noting that Israel has known about them for quite a while and Hamas hadn’t used them until this round of fighting began. So what, really, did Israel gain? It failed to destroy the unity agreement, at least so far; it destroyed or caused Hamas to use about two-thirds of its rockets, but those can be replenished and at the point of the ceasefire, Hamas and other factions were still firing at will; and the tunnels it eliminated had been there for years posing only a potential threat. These things were bought by Israel at the price of Palestinian blood, and also a higher death toll for Israel than it is accustomed to (67, including three civilians). As much as it seems Israel doesn’t care about that price, it is clear that Israel’s image took a major hit in this engagement. Formerly sympathetic media showed injured children and destroyed neighborhoods in their pictures and newscasts. Even the United States expressed concern about the disregard for civilian life and called the attack on a United Nations school that was housing refugees “disgraceful.” Great Britain is reviewing all military sales to Israel, and Spain has suspended all military sales, meager though those sales may be. Those things should not be overstated. England and Spain are merely expressing their displeasure at Israel’s total disregard for civilian life in Gaza and will re-commence their sales to Israel in due course, undoubtedly. Despite its occasional statements, the United States has repeatedly defended Israel throughout this episode and is using the ceasefire to send more supplies to its ally. Still, Israel has definitely come out of this appearing far more villainous than the “terrorist” Hamas. That’s going to make a difference going forward. Israel may not be able to continue to bury the issue of the Gaza blockade, a form of collective punishment that has only helped solidify Hamas’ rule in Gaza and has deprived the people while, obviously, not stopping the buildup of rockets. No one bought into the anti-Iran portion of Netanyahu’s rhetoric, another failure for Israel. Even in the U.S. Jewish community, this onslaught shook a lot of pro-Israel faith and sent other Jews out of their living rooms and into the streets. There’s really little to say here. The U.S. will look back at its actions in the Middle East in 2014 as one of the lowest moments in diplomacy in its history. John Kerry failed to broker a ceasefire; when he finally got one, it was broken within two hours. While both sides had different stories about who really broke the ceasefire, the Israeli narrative dominated and allowed Netanyahu to defiantly tell the United States not to “second-guess him” about Hamas. Leaks to Israeli media disparaged both Barack Obama and Kerry. The U.S. showed the world that while it does have the power to pressure Israel, it is not going to use it, no matter how bloody Israel’s actions or how insulting to its patron Israel’s behavior. Yet it stands alone in the world in defending Israel’s actions. The Obama Administration has had some occasional good ideas about the Middle East, but has repeatedly shown it hasn’t the first clue how to implement them. Instead, it paints itself as an advocate for peace, but consistently shows no willingness to back up its words in the face of Israeli resistance. The result is that it is even more important than ever that Europe or some other outside party push its way past the United States in dealing with this issue. Netanyahu is the master of half-truths. When listening to politicians, what they don’t say is often more important than what they do say. Does “We do not target civilians” really mean “…..but we don’t have any compunction about slaughtering them if they get in our way?” Otherwise, how can we explain using enough explosive to kill 10 people in a nearby building, in order to eliminate three “terrorists” on a motorcycle? I also suspect that the “terror tunnels” were less of a threat than Israelis were led to believe. As far back as the 1914/18 war, sappers were able to listen for the sounds of the enemy digging and take retaliatory action. I have no doubt that, with 21st century technology, it is impossible to dig a tunnel without anyone else knowing about it. A pragmatic approach would be to wait until the tunnel was almost finished, then destroy it from the Israeli side of the border. I am sure that there are many good people living in Israel. It is a pity that they are led by such a bunch of lying madmen.